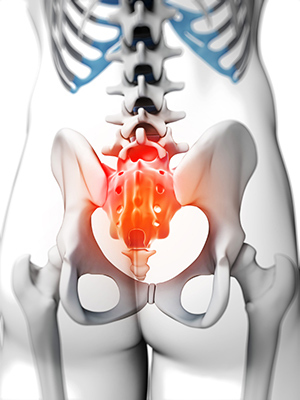 Sacroiliac joint dysfunction causes strong lower back pain and leg pain. If left untreated, SI joint dysfunction can worse, leading to an even higher level of pain and discomfort. Thankfully, The Spine Center can help. Doctor Saqib Siddiqui uses minimally invasive procedures for fast, effective treatment so you can enjoy a life without back pain. Sacroiliac joints are located at the bottom of your back. There’s one on each side of the spine. These joints allow for twisting movement for your legs. These joints can become either too rigid or too loose. Both types of sacroiliac joint dysfunction are equally dangerous; they can cause pain as well as damage to surrounding ligaments and muscles. Your back and leg pain could be caused by any number of conditions. That’s why it’s important to schedule an appointment with The Spine Center so Doctor Saqib Siddiqui can determine the exact pain source. Call (954) 916-7062 or contact us online to set up an appointment concerning sacroiliac joint dysfunction and back pain.